One of the most recognizable images in the US is the “HOLLYWOOD” sign in Southern California. People from all over the globe come to “Tinseltown” to gaze at cement footprints of stars and perhaps catch a glimpse of celebrities who might pass by. It’s hard for these visitors to miss the sign anchored in the foothills nearby. Less well known in the Hollywood hills is another easily recognized symbol—one with eternal significance. 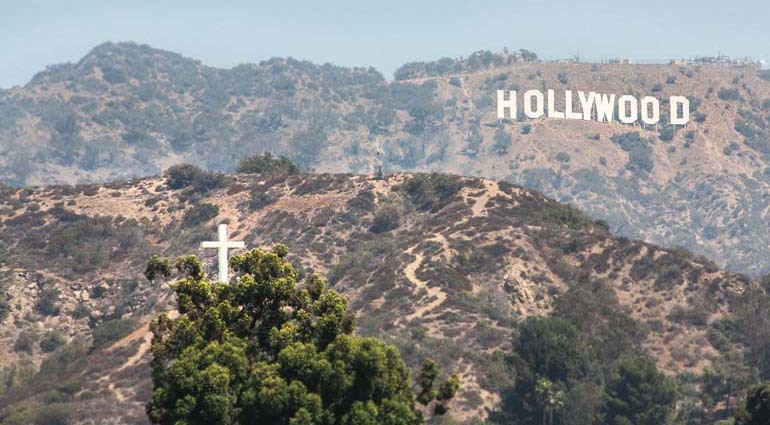 Known as the Hollywood Pilgrimage Memorial Monument, this 32-foot cross looks out over the city. The cross was placed there in memory of Christine Wetherill Stevenson, a wealthy heiress who in the 1920s established the Pilgrimage Theatre (now the John Anson Ford Theatre). The site served as the venue for The Pilgrimage Play, a drama about Christ. The two icons showcase an interesting contrast. Movies good and bad will come and go. Their entertainment value, artistic contributions, and relevance are temporary at best. The cross, however, reminds us of a drama eternal in scope. The work of Christ is a story of the loving God who pursues us and invites us to accept His offer of complete forgiveness. The high drama of Jesus’ death is rooted in history. His resurrection conquered death and has an eternal impact for all of us. The cross will never lose its meaning and power.